If getting on and off of the toilet has become a chore for you, then consider getting an higher toilet seats that is raised for your needs called an elevated toilet seat. Elevated toilet seats can provide both comfort and safety by decreasing the distance you must travel to sit and stand. It is not only limited to the disabled and elderly but can serve a purpose for post operative patients and those with hip or knee pains. Why does decreasing the toilet distance make a difference? Imagine a very low toilet. Squatting down to the low toilet would require plenty of strength and put some physical strain on your knees and hips. Now imagine a toilet higher than the one you use now. There would be less bending at the knees and hips. It would also take almost no effort to sit down. Who Can Use Elevated Toilet Seats? 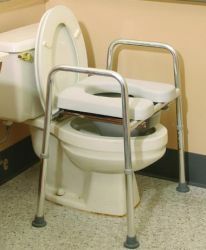 Elevated toilet seats are effective for those who have lost any amount of power and mobility whether due to age or injury. The necessary range of motion is lessened by an elevated toilet seat, which makes bending, sitting, straightening, and standing much easier. An elevated toilet seat is a durable, safe, and effective option that can make daily habits much more comfortable and convenient for you or those you love. There are various styles to choose from such as clamp-on seats, seats with or without handles, cushioned seats, seats with legs that extend to the floor, and even seats with arm rests. Some seats are made with deeper front and rear cut out areas to facilitate easy personal cleaning. A splash guard is also available on some elevated seats. Seats can come with or without lids. Some are designed with adjustable heights. Removable armrests like toilet safety rails, are a great feature if someone will be transferring back and forth from a wheelchair. There are also toilet risers with legs, like the image in the right, that provide extra support and stability for someone sitting on a elevated bathroom toilet seat. Other options include antimicrobial properties on the seat. 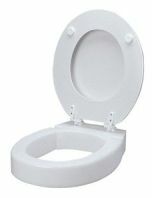 Raised Elongated Toilet Seats – This raised toilet seat fits in between your elongated toilet bowl and toilet seat. It adds 3 inches to the standard height. Buying simple elevated toilet seats can range anywhere from $30 to $50 dollars, while added amenities can raise the prices up into the hundreds of dollars. Bathroom toilet seats can be found in very simple and basic styles as well as quite luxurious and fancy. Check out our online store for a good selection of styles and prices. Installation and maintenance is relatively easy for most seats. 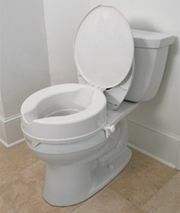 Most raised toilet seats fit right on top of a standard or elongated toilet bowl. Many seats simply lock into place using brackets and no tools are needed. Though they are extremely stable and safe, the elevated seats can also easily be removed to accommodate others using the same toilet. 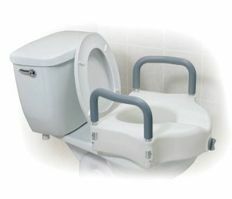 Hinged toilet seats can simply be lifted and lowered between users. This type allows for easy cleaning. There are also bottom install toilet seat risers that blend in with the original toilet because they are placed at the foundation instead of the top. Turn your short bathroom toilets into tall bathroom toilets. Taller bathroom toilets can help those after hip or knee surgery and for people who have squatting problems. But there is a slightly greater degree of difficulty when installing toilet seat risers that are placed on the ground because the entire toilet must be removed and then placed on this pedestal. If this is not a concern, then you can add on 4 inches of height and not worry about any unsightly toilet riser tops. They also are capable of supporting up to 500lbs of weight. Here are two recommended bathroom toilet seat risers. Toilet seat elevators are usually the bottom install toilet seat risers that were discussed above. 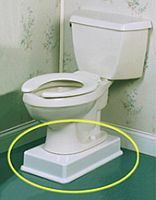 Instead of placing the increased height on the surface of the toilet seat, it is placed on the ground level. These toilet seat elevators blend in seamlessly with the bathroom environment. Most people will not notice until they actually sit on one and discover how much easier it is to sit down and stand up from the toilet. If using public restrooms is difficult, investing in a portable, lightweight elevated seat is a great option. Since they are easy to install, they can be taken from place to place to ensure maximum comfort and ease wherever you are. In your private accessible bathroom, they should be permanent fixtures that will reduce your strain while standing up from or sitting on the toilet.